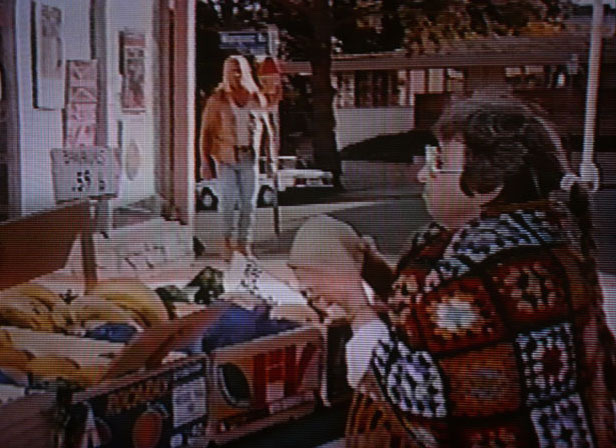 Wherein Sir Terry Bollea (AKA Hulk Hogan) encounters a melon-thumping granny, ripe for the picking. Bet you can tell she’s a granny from those squares she wears, huh? Huh? This seems like a typical case of Hollywood ageism mixed with some severe craft stereotyping… real crochet-cism in action! I mean, when will these pesky movie PA’s realize that crochet is ageless — and more importantly — that an afghan does NOT a shawl make? This entry was posted on February 3, 2014 by croshame. It was filed under Hookin' At the Movies, Movie Still Monday .